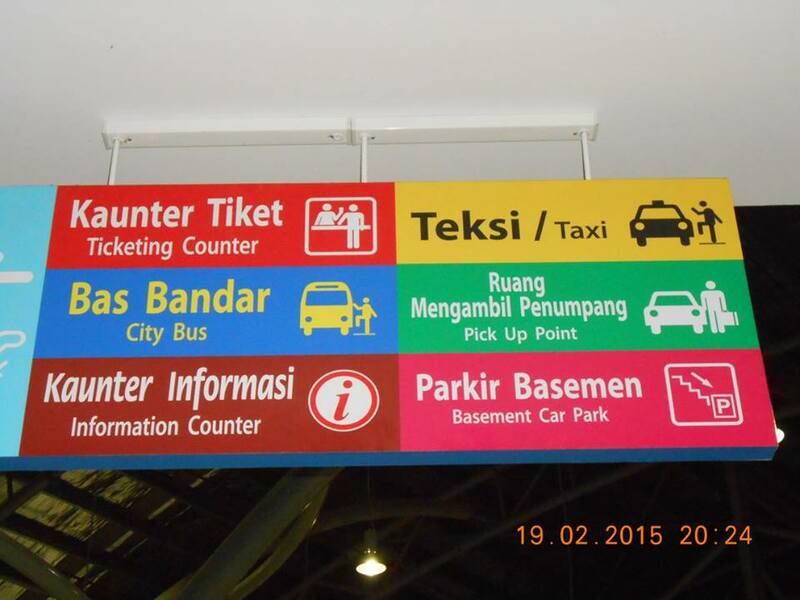 THE AMANJAYA BUS TERMINAL is 15km from the City Center. 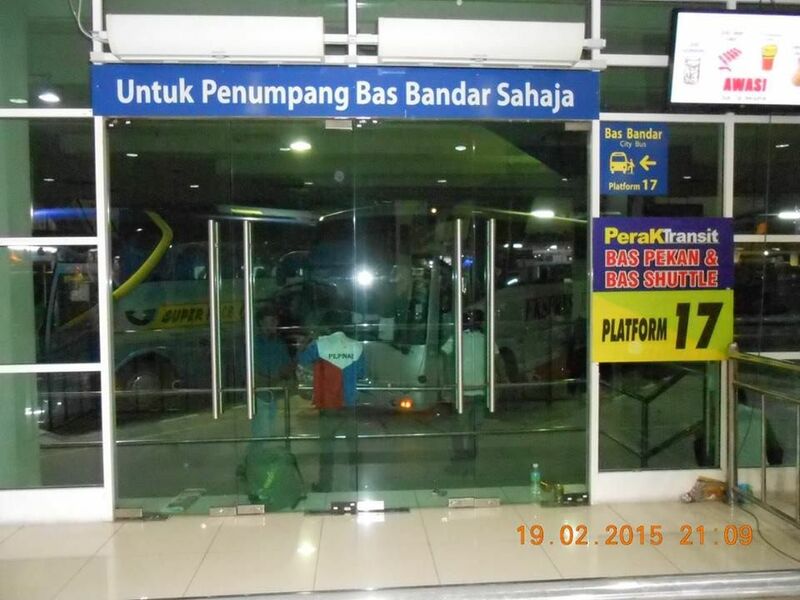 Travellers catching express buses have to go to Amanjaya to embark or disembark. I visited Amanjaya today to see what else is new. These were not here when I last came. The place was not open yet since it was 8.15 am. 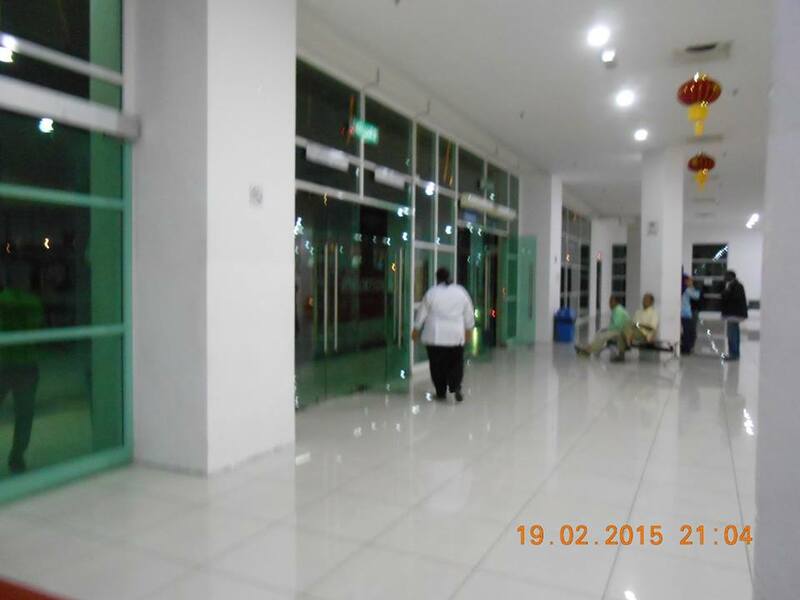 This is a planned terminal that is out of Ipoh town which is about 15 minutes away. There are a few shops selling snacks while most of the floor space is taken by the different bus companies. The place is air-con and there are a few benches (many more are needed) for passengers to seat. 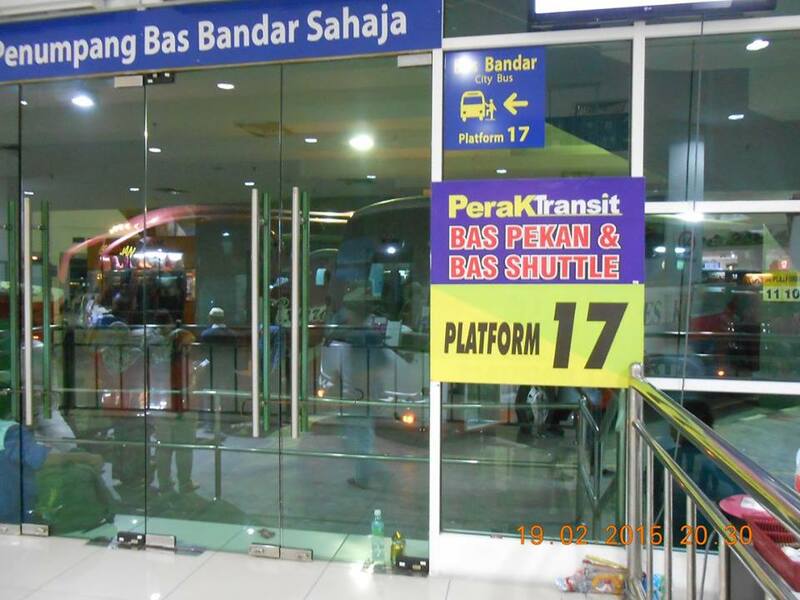 New bus terminal serving Ipoh area. It is not air-conditioned, so it was stuffy, hot and humid. Vendors are loud and noisy, screaming and I don’t know the language thus not sure if they are screaming out their price or to tell their stall that they have a customer. The stops are mere stalls, thus not organized and much like a market place. If you are looking for travel accessories such as a phone card, you will not be able to find any. This is one of those cheapy construction and with no interior design public area in Ipoh. One more thing, you have to pay to use the bathroom, which was wet and have no toilet paper. On the 1st day of CNY, a promise made is a promise broken. I’m waiting for the YoYo bus to arrive from the KLIA. 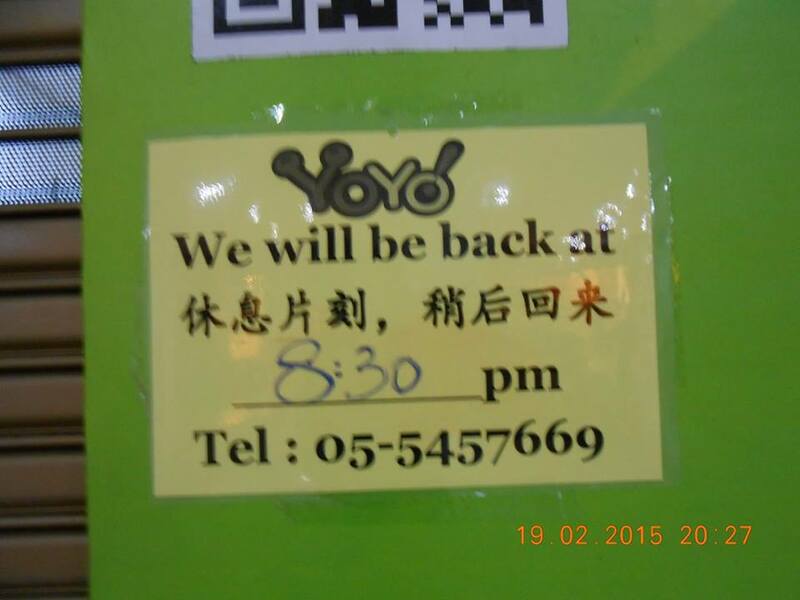 It will be late, and the staff at the YoYo office at Amanjaya knows that. It’s 9.02pm, and they are NOT back. Indeed, when I left at 10.15pm, the shutter was still down. Maybe they wrote pm instead of am. Back at 8.30am next day! When you arrive and walk through the front entrance, you’ll see this, the Information Counter. Don’t waste your time here. The 3 ladies know little and are there for decorative purposes only. A foreigner wanted to know where he and his friends could catch the City Bus to town. Not knowing Bahasa Malaysia, he asked me for help. “No bus. It’s past 8pm, so the last bus has gone,” said one of the ‘decorations’. “Take a taxi,” she added. She is so ‘helpful’, a fount of little information! Look at the time on the photo, 8.32pm. No, the last bus hasn’t left. The ‘decoration’ gave wrong information! Here is the last City Bus! The time on the photo says 8.40pm. I wander around some more, trying to locate the place where the City Bus is taken. “Oh, here is the place,” I think to myself. This is on the ground floor, where commuters wait for the arrival and departure of inter-city buses. However. I am wrong. No, this is no longer the place. 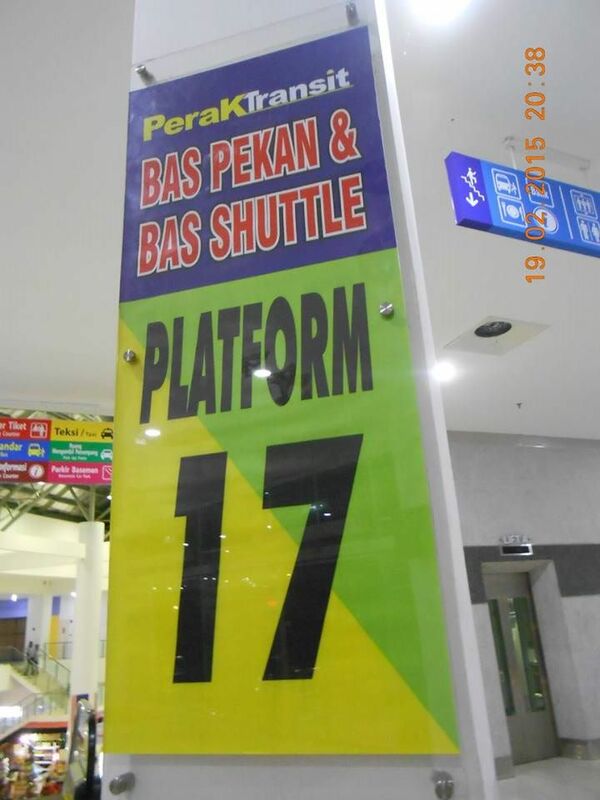 Never mind the HUGE WORDS that say that this is Platform 17, which is for ONLY passengers of the City Bus. 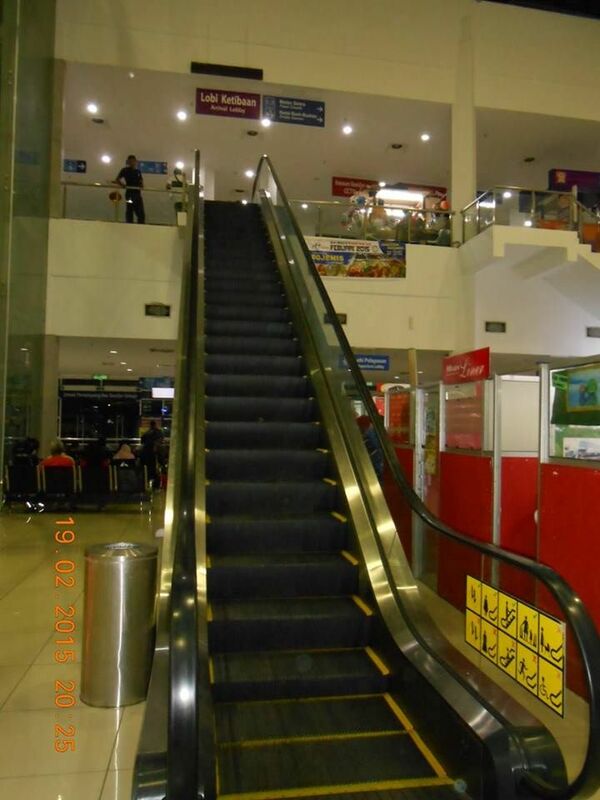 I take the escalator upstairs. Never mind. I go searching for Platform 17. No such place. Only Platform 1, 2 and 3 on this floor. No problem! Ask a security guard. Security personnel tend to know a whole lot more than anyone else. “Go outside,” she instructs me, pointing to Platform 1. I go outside, and I see the City Bus! Aha, the mystery is solved! Platform 17 is on the OTHER SIDE of Platform 1. From the inside, it is Platform 1. From the outside, it is Platform 17. Never judge the platform from its sign, or something like that? Strange are the ways of the Amanjaya Bus Terminal. 44 cases of lost luggage have been reported since the start of the year until early this month. That is higher than the 33 in the corresponding period last year. Ipoh district police chief ACP Sum Chang Keong said the cases resulted from carelessness by travellers. “We hope the people will be careful with their personal belongings at all times. The situation is still under control as we have our patrol unit monitoring the terminal frequently,” he said during a high-profile policing programme at the terminal here, recently. Present was Department of Crime Prevention and Community Safety (JPJKK) chief ACP Hamidah Yunus who said that the high-profile policing programme had gained positive feedback from the people. It’s a promise that can’t really kept! Here is the latest twist in this depressing story. 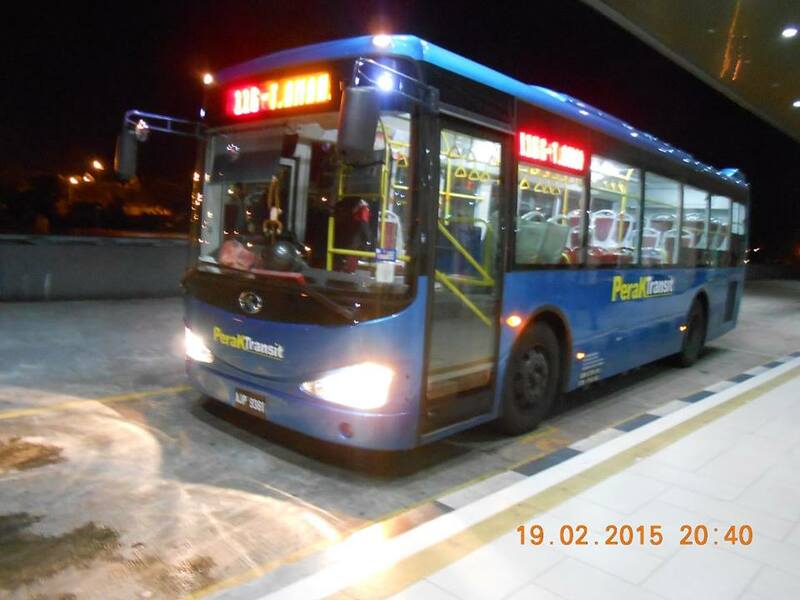 IPOH — The Land Public Transport Commission (SPAD) and state government are seeking a solution to the problems faced by express bus operators following their relocation to the Amanjaya Terminal in Meru Raya. Perak Menteri Besar Datuk Seri Dr Zambry Abdul Kadir said the problems faced by express bus operators were also discussed when SPAD met him recently. “I told them to come back to the state government for more solutions that can be implemented. This is because the number of bus operators that moved to the Amanjaya Terminal also needs attention,” he told reporters after chairing a state exco meeting here today. This was after bus operators who moved to the Amanjaya Terminal voiced their discontentment at the SPAD office, Rural Transformation Centre, here last month, as there were some bus operators still operating in the old premises despite the order to move on July 29. 1 When Amanjaya was opened some two years ago, there were fears that it would become a white elephant. A white elephant is some thing for show. It is something of dubious value, a financial burden that is expensive to acquire and equally expensive to maintain. 2 Amanjaya soon turned out to be exactly that, a white elephant. Hardly anyone wanted to use it. The operators who were in the city center and nearby residential areas shunned it. Why pay rent for a stall in an empty place far from where commuters lived or worked? Indeed, while business remained good where they were, those who shifted to Amanjaya had hardly any business. These businesses lost money. If you were a commuter, why would you go all the way to Amanjaya, 15km from the City Center, when you were merely 5-10 minutes from Medan Gopeng, or the Sri Maju bus station, or the YoYo Bus office in Bercham? Commuting to and from Amanjaya is inconvenient and slow. A transit bus ticket is affordable at RM2.50 but the trip takes about an hour. Moreover, the bus doesn’t take you anywhere near your home. When you arrive at the City, you have to find another form of transport home. A taxi is exorbitant at RM20 a trip but at least it takes you directly to your home. After midnight, if you can find a taxi, it won’t be RM20! AMANJAYA WAS TURNING INTO A WHITE ELEPHANT! 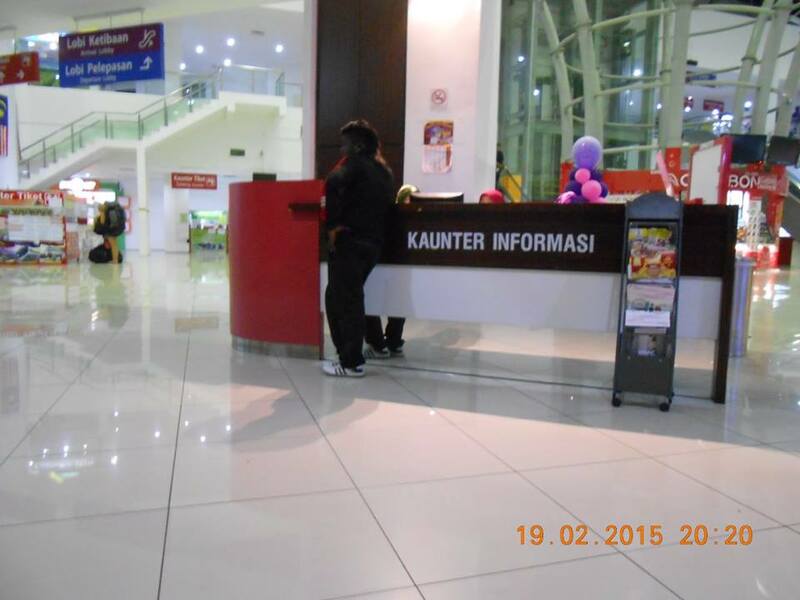 3 The bus operators at Amanjaya complained and their petitions fell on the willing ears of the authorities. Who are these authorities? Names won’t be named but these are those civil servants who planned and built it, those who enforce public transport regulations, etc. The authorities decided to shut down Medan Gopeng! All those small businesses who depended on Medan Gopeng, directly and indirectly, lost their livelihood almost instantaneously. Medan Gopeng died, and with it, everyone dependent on it for their business. 4 That drastic act didn’t work! Commuters still shunned Amanjaya. Bus operators with offices in the City continued to pick up or drop off travellers at their own premise or near Medan Gopeng. 5 Operators at Amanjaya were furious and desperate as well. It was a case of STILL LITTLE OR NO BUSINESS! They demanded that the authorities do something about that! 6 The authorities listened to those complaints. They have always understood that Amanjaya MUST NOT FAIL. Their careers in the Civil Service would suffer if it happened. What should they do about the situation? They forced ALL bus operators to shift their operations to Amanjaya. 7 Bus operators could sell tickets at their own premises but their commuters had to board their buses at Amanjaya or get down there. Thus, I, living a few minutes’ drive from the YoYo Bus office, travelled all the way to Amanjaya, 30 minutes’ drive away, to board the YoYo bus to LCCT! 8 The uproar from commuters was so loud and insistent that the rules were again changed. From 1 October 2013, commuters could once again board or get off at the premises of bus operators. You would think that that would be the end of the saga. No, it is not. 8 Representatives of bus operators in Amanjaya have once again voiced their objections! They want a solution to the problems that have returned. If the authorities won’t help them, they will go to the Mentri Besar. What if he won’t help them? They will go all the way to Putrajaya. FROM TUESDAY, 1 OCTOBER 2013, CATCH THE YOYO BUS FROM ITS OFFICE IN BERCHAM, OR THE STAR SHUTTLE BUS FROM ITS OFFICE IN BERCHAM! 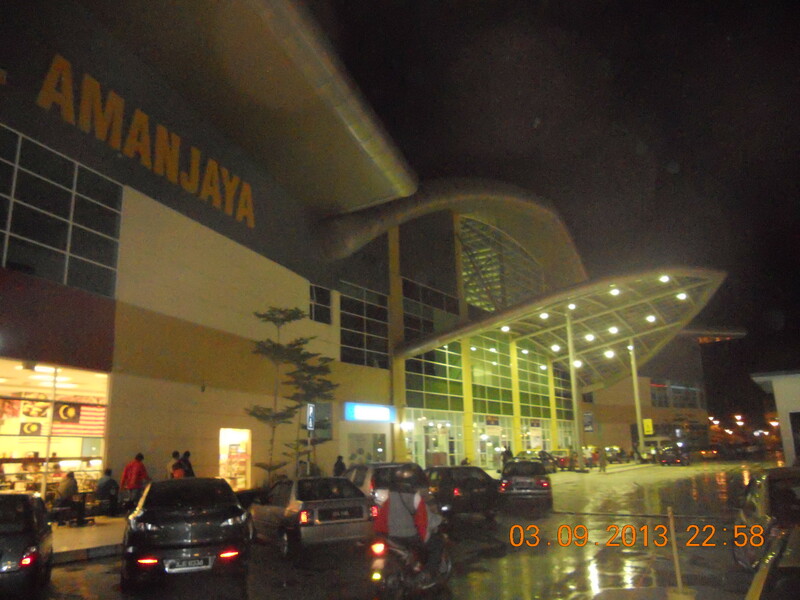 You no longer have to go to Amanjaya in Jelapang. SOMEBODY FINALLY HAS SOME SENSE. BLOGGER WENT TO AMANJAYA TO CATCH A YOYO BUS TO THE LCCT on Wednesday, 4th September 2013. 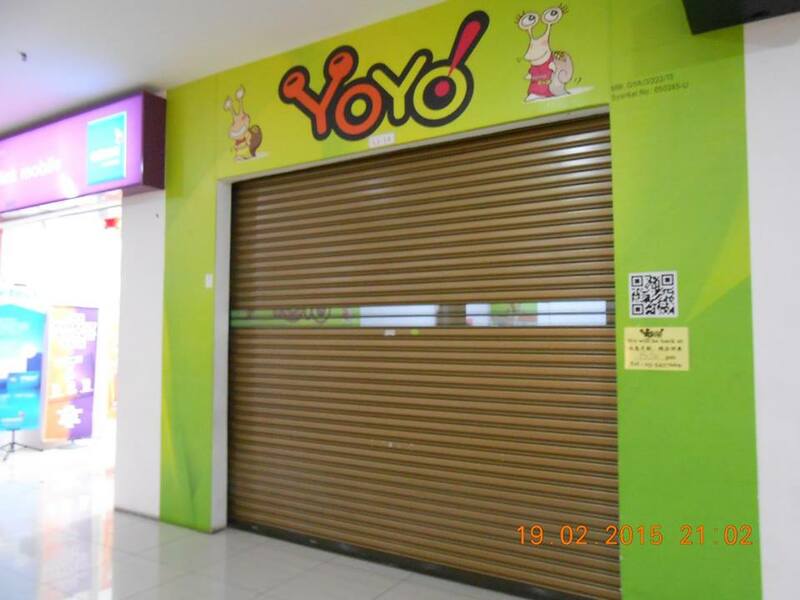 I used to catch the YoYo bus to go to the LCCT from the YoYo office. That is a 5-minute drive. 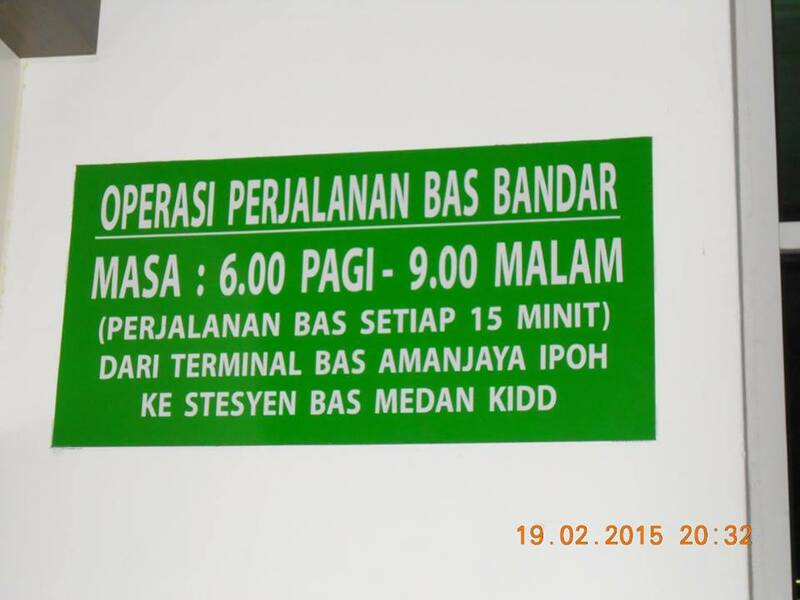 This time, it involved 25 minutes of driving to the Amanjaya Bus Terminal. I had to catch the midnight bus. 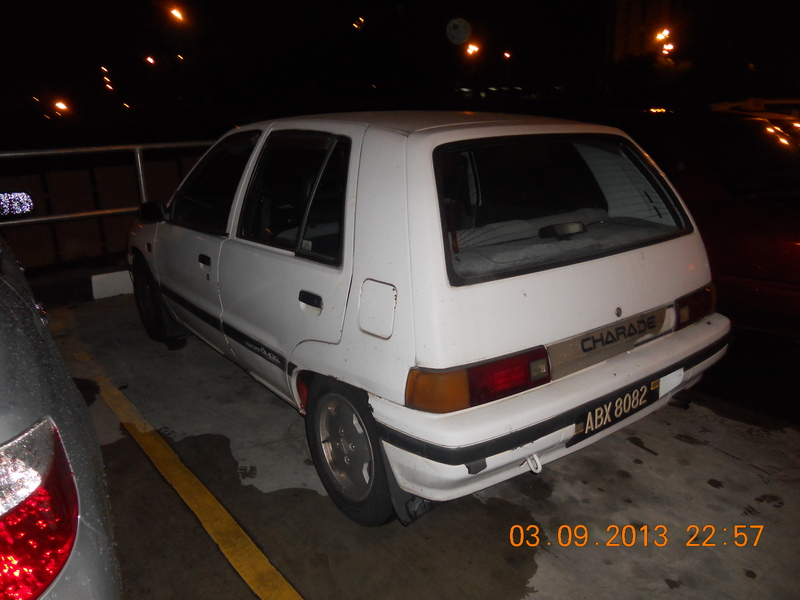 It was not safe for my wife to drive so far by herself back home after dropping me off, or to come to fetch me the next morning at 1.45am; and inconvenient to get someone else to fetch me there; so I drove there in my old junk, and parked it. At least the parking was free. It was 10.57pm on Wednesday, 3 September when I took this photo. With a prayer in my heart that the car would still be there when I returned, I went inside. 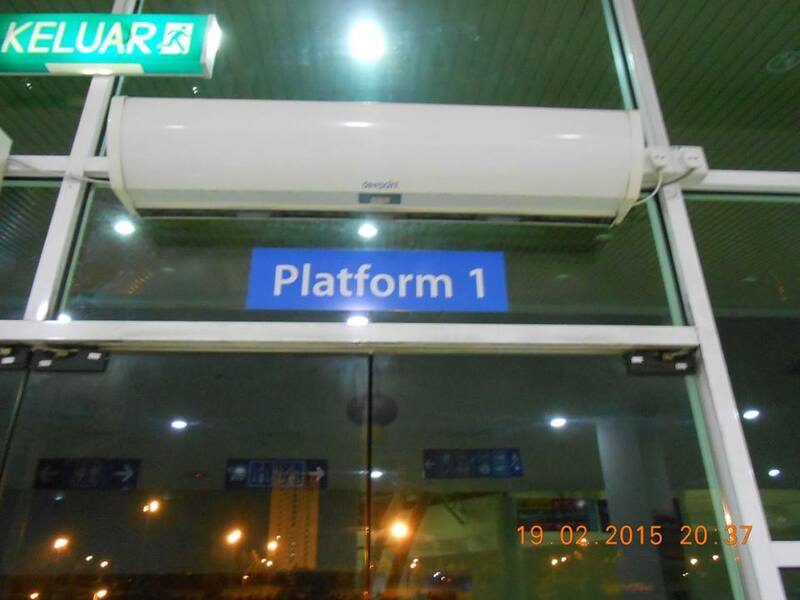 This entry was posted in Uncategorized and tagged Amanjaya Ipoh terminal, bus terminal, communications, inter-city transport, Ipoh, KLIA, LCCY, Medan gopeng is shut, Meru Raya Terminal in Jelapang, Perak, star shuttle, transport, white elephant, yoyo bus. Bookmark the permalink.